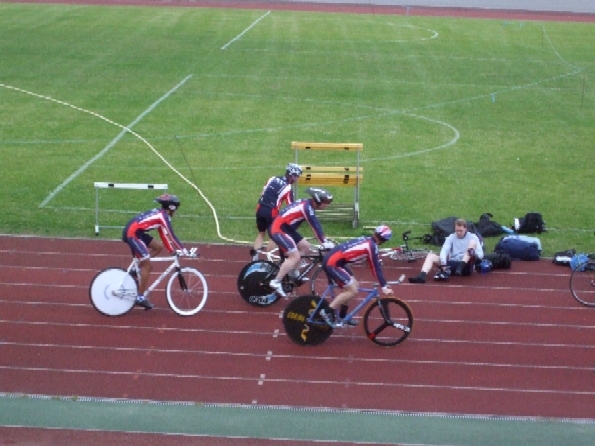 After the Team Pursuit was rained off on the 7th July it was rescheduled to the 15th July, this left us with problems. Dave Peck was flying out to Italy that day to ride the Pinarello and Rob Drinkwater was unavailable to attend as that was the day he was expecting to give birth. Both teams were re shuffled Stuart Stow joining John Warnock, David Jack and Gavin Mitchell in Twickenham A team. Kevin Butchart and Tom Sutherland were drafted in to join Nigel Atkins and Will McFarland in the Twickenham B team. The hours leading up to the team pursuit there was quite a lot of rain in West Drayton and I feared it would be rained off again. We left home at around 6pm, the journey was going well until we got past junction 8/9 on the M4 the traffic came to a stop and we sat there for about forty five minutes, by this point I was concerned if we were going to get there at all. Then the traffic started to move and we went passed a Peugeot 206 which had no front end. We arrived at Palmer Park and the track was dry but very sandy from the long jump pits. Dave, John, Stuart, Nigel and Kevin were all there warming up and preparing their bikes. Then we heard the news that Tom and Will had a mystery illness and would not be turning up. With raised eye brows we discussed whether to reshuffle the teams again or just run one team. We decided to run the A team as we had planned while Kevin and Nigel would have a go but it wouldn’t count because they didn’t have enough riders. 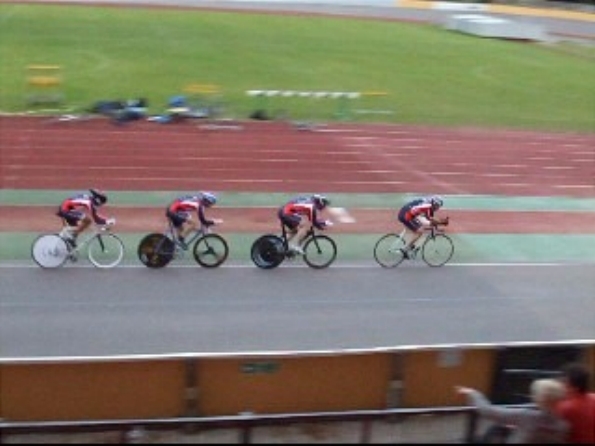 After a long warm up we rolled round to the back straight for our heat against AW Cycles. Our starting order was John, Gavin, Stuart then David. We started off John immediately pulling a few lengths away from me but I managed to pull it back before we left the first banking, looking at the video it wasn’t our best start but we were away with no troubles. We got into our rhythm quickly and were lapping at 36 seconds. 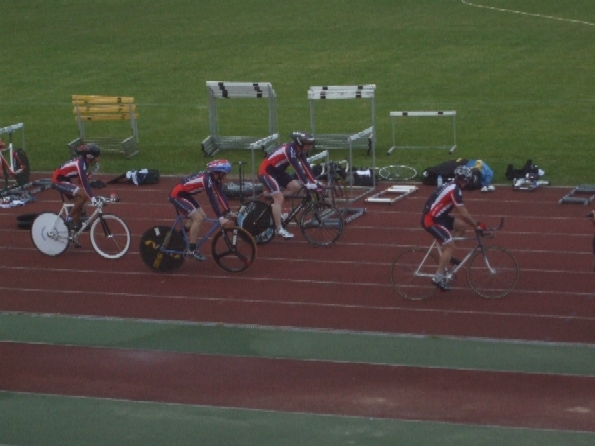 After 5 laps we were going well but we were being quickly chased down by AW Cycles. As we went passed AW’s station we did not hear a shout from their judge, at the time Stuart was on the front and when we arrived at the banking he swung up the banking as AW were coming around us. Stuart had to stay high so they could come under him, AW didn’t exactly hurry when they passed us and Stuart was left at the top of track for the entire length of the banking, by the time it was clear for Stuart to drop down the track onto my wheel a gap had grown to about 20/30 meters which Stuart was unable to chase down. With 3 laps to go and with 3 riders left we were ready to start cranking up the pace but after AW had passed us they didn’t move ahead, they were now slowing us down. All in all AW Cycles made a right hash of it and it did cost us a couple of seconds. We came home in a time of 05:25:10, AW Cycles coming home in a time of 05:07:83. It was clear that AW were in the final but would it be against us or Reading CC, who were in the next heat against DNA Cycles. Reading CC had a good ride catching DNA fairly quickly but lost a rider with about 4 laps to go. We knew it was going to be tight and Reading had a fast finish setting a time of 05:16:71, with DNA Cycles stopping the watch at 05:52:10. The final for the regional championship was AW Cycles v Reading CC, with Twickenham CC coming 3rd getting the bronze medal. Kevin and Nigel were getting ready for there ride, while David Jack had a word with the organiser. Dave managed to negotiate two of the Twickenham A team joining Kevin and Nigel as we hadn’t made the final. We lined up on the back straight John starting us off followed by Nigel then myself then Kevin. We started off not as fast as our last ride but we were riding at 38 second laps. At about half distance we lost Kevin. I now had John behind me and we started to begin to crank the pace up, when I got back to the front I could hear John cheering me on from behind me, by this point I was starting to feel a bit tired and what I could hear John wasn’t even out of breath. We finished strongly recording a time of 05:34:70 with wasn’t a bad time considering John and I had ridden twice. Although this ride didn’t count it was worth it as Kevin and Nigel had travelled and were eager to ride. Kevin benefited from the sessions we had the most and this showed in the team pursuit by the two big efforts he put in on the front. 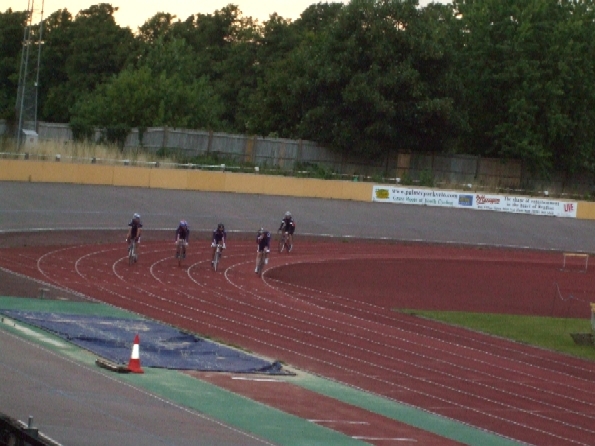 The final saw AW Cycles in the home straight take on Reading CC in the back straight. The first two laps where pretty even, then AW Cycles started to pull out a lead. With 3 laps to go Reading CC lost a rider and AW Cycles were beginning to see Reading CC at the end of either straight. AW Cycles won Gold with a time of 05:08:34, Reading CC getting Silver with a time of 05:14:53. In conclusion it was a lot of fun riding the Team Pursuit and it was an event I’ve always wanted to compete in ever since I started cycling. With the performance we gave we have a good foundation to build on and to improve our time next year and maybe even win. I would like to thank Sean Bannister for running the sessions and being there on the night, I would also like to thank my family for helping during the sessions and during the event.